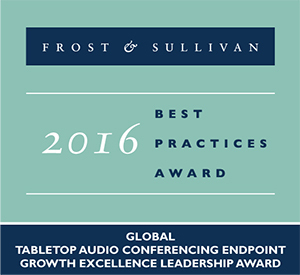 Hamamatsu, Japan — Yamaha, a leading pro audio company, received the Growth Excellence Leadership Award in the Global Tabletop Audio Conferencing Endpoint Market from Frost & Sullivan. The award, based on recent industry analysis and evaluation, recognizes Yamaha Corporation for its exceptional growth and dedication to superior sound engineering capabilities. Over the last four years, Yamaha Corporation has tripled its revenue share, positioning it as the second leading global provider of tabletop audio conferencing solutions. "With 48 years of experience in the development of professional audio systems, Yamaha Corporation has grown to be one of the main leaders in the tabletop audio conferencing endpoints market," said Mohamed Alaa Saayed, ICT principal analyst - connected work digital transformation, Frost & Sullivan. "Over the years, Yamaha Corporation successfully expanded its portfolio of audio conferencing endpoints to become a true one-stop-shop of tabletop audio conferencing devices. With a high degree of innovation evident in its entire product portfolio, Yamaha Corporation efficiently addresses key customer pain points and helps business users to be more efficient and productive." The Frost & Sullivan Best Practices Awards have identified exemplary achievements within a multitude of industries and functional disciplines for the last 17 years. Frost & Sullivan conducts best practices research to properly identify unrivaled innovation and leadership among companies, products, processes, and executives. Receiving the Frost & Sullivan Growth Excellence Leadership Award is a compelling, third-party validation of a company's growth strategy and execution. "This industry recognition from Frost & Sullivan underscores our dedication to delivering exceptional conferencing experiences," said Hirofumi (Hogan) Osawa, executive officer, senior general manager of audio business division and general manager of UC Department, Yamaha. "As the market becomes increasingly crowded, we are focused on engineering solutions that solve the unified communications and productivity challenges of remote meetings through superior audio solutions. By enabling natural, clear conversations in any environment, we can help businesses connect and be more successful well into the future." Since its founding in 1887, the Yamaha Corporation Group has developed its business activities focusing on musical instruments, audio products, Yamaha music schools, semiconductors, and other products and services related to sound and music. Yamaha acquired Massachusetts-based Revolabs in 2014, an innovator that continues to grow in the UC market with superior audio production in wired and wireless microphones, video sound collaboration systems, simple plug-and-play audio, and local and cloud-based management solutions. With its unique expertise and sensibilities, gained from our devotion to sound and music, Yamaha is committed to creating excitement and cultural inspiration together with people around the world.